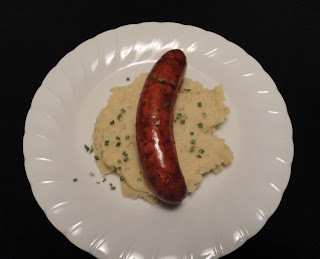 Bangers and mash, also known as sausages and mash, is a traditional English dish made of mashed potatoes and sausages, the latter of which may be one of a variety of flavoured sausage made of pork or beef or a Cumberland sausage. The dish is sometimes served with a rich onion gravy. It can also often be found served with fried onions. This dish may, even when cooked at home, be thought of as an example of pub grub relatively quick and easy to make in large quantities as well as being tasty and satisfying. More up-market varieties, with exotic sausages and mashes, are sold in gastropubs, as well as less exotic alternatives being available in regular public houses. Although it is sometimes stated that the term "bangers" has its origins in World War II, the term was actually in use at least as far back as 1919. The term "bangers" is attributed to the fact that sausages, particularly the kind made during World War II under rationing, were made with water so they were more likely to explode under high heat if not cooked carefully; modern sausages do not have this attribute. Copyright 2012. Christine's Pantry. All rights reserved. Place the potatoes in large pot, cover with water, bring to boil, add salt. Cook until fork tender. Drain and return potatoes back to the pot. Add butter chicken broth, spicy mustard, salt and pepper, mash until smooth. In a skillet, heat oil over medium high heat. Brown sausage on all sides, until cooked through. Garnish with chives. Enjoy! My meat and potatoes family could not resist this meal! I would love to be eating this right now! Looks delicious, and that sausage looks perfectly cooked! This dish can sometimes be colorless--the use of chives gives it a great pop of color. Looks yummy! Ooo, I do so love sausage and taters. I love the addition of the spicy mustard to the potatoes in this. Yum! Oh yum. I spent some time in the UK after college and I tried to get a banger in my mouth at least weekly. Nothing beats it! Haha, I never knew why they were called bangers, that's awesome!